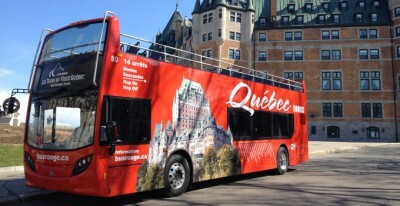 Discover Québec City from an Open-Top bus! 14 stops at Quebec City's top tourist sites on an hop on hop off tour. Discover the Old Quebec at your own pace. Discover the Montmorency Falls, the Sainte-Anne de Beaupré Shrine and the Island of Orleans in this Half-day tour. Enjoy our countryside tour and discover Quebec City from an open-top bus ! Experience the European charm of the first French settlement in North America. This tour covers many of the major attractions in Quebec city. Discover the beautiful Old Quebec along with the Sainte-Anne de Beaupré Shrine, the Montmorency Falls and the Island of Orlenas in this full day tour. Discover the beautiful Whale Kingdom located in the Charlevoix region, travel through its enchanting sites and landscapes, witness at first hand the rugged regions of our first settlers. From July 19th to July 23rd, 3 stops will be closed, we offer a temporary stop in that area.